The Moustached Warbler, Acrocephalus melanopogon, is an Old World warbler in the genus Acrocephalus. It breeds in southern Europe and southern temperate Asia with a few in north-west Africa. It is partially migratory. South west European birds are resident, south east European birds winter in the Mediterranean breeding range, and the Asiatic race migrates to Arabia and Pakistan. It is scarce north of its range, but has occurred as a very rare vagrant as far as Poland and Denmark. There are a few reports from Great Britain, including a pair breeding in Cambridgeshire in 1946, but these records have recently been removed from the official list of British birds. 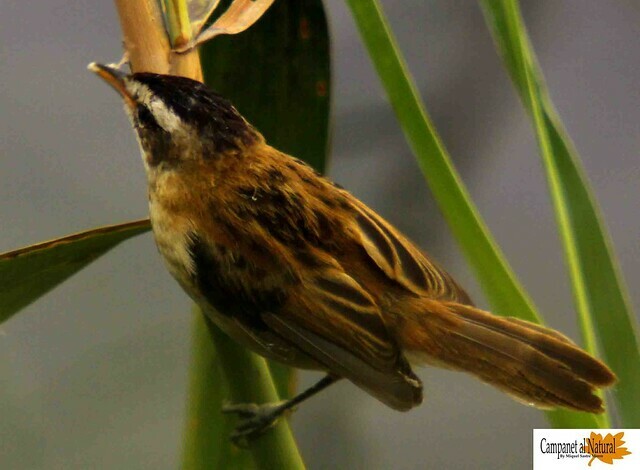 This passerine bird is a species found in upright aquatic vegetation such as reeds and sedge. 3-6 eggs are laid from mid-April and incubated for 14–15 days. The nest is built over water among reeds or rushes or in a bush. This species is usually monogamous (Leisler & Wink 2000). This is a medium-sized warbler, 12-13.5 cm long, slightly larger than the similar Sedge Warbler, Acrocephalus schoenobaenus. The adult has a finely streaked brown back and white underparts. The forehead is flattened, there is a prominent whitish supercilium, grey ear coverts, and the bill is strong and pointed. The sexes are identical, as with most warblers, but young birds are more heavily streaked and have markings on the breast. Like most warblers, it is insectivorous and also feeds on water snails. The song is fast and similar to the Sedge Warbler and Reed Warbler, with some mimicry and typically acrocephaline whistles added. Its song is softer and more melodious than those of its relatives, and includes phrases reminiscent of the Nightingale. Unlike the Sedge Warbler, it does not sing in flight.